Shabnam Assadollahi is a veteran human rights advocate who has worked extensively helping newcomers and refugees resettle in Canada. She has distinguished herself as a broadcaster, writer and public speaker. While her primary and heartfelt interest focuses on the Iranian community and events that affect both women and minority communities in the land of her birth – she also advocates for the emancipation of women and minority religious communities worldwide. A resident of Ottawa she is active in community affairs including cultural, educational and humanitarian activities. Kaveh Taheri: In your opinion, what is the cause of the surge in executions and arrests in Iran, and why is the regime turning a blind eye to international warnings, and to what extent do you believe human rights activists and organizations could help prevent or end the human rights violations in Iran? Shabnam Assadollahi: The surge of executions in Iran has political motivation. Iran’s president Hassan Rouhani’s promises of bringing dignity and hope to the nation, freeing political prisoners, promoting civil rights, and bringing moderation for Iranians were broken almost immediately upon his taking office. Not only have the promises made by Rouhani to the UNHCR never been kept, but executions, persecution and human rights violations have significantly increased. 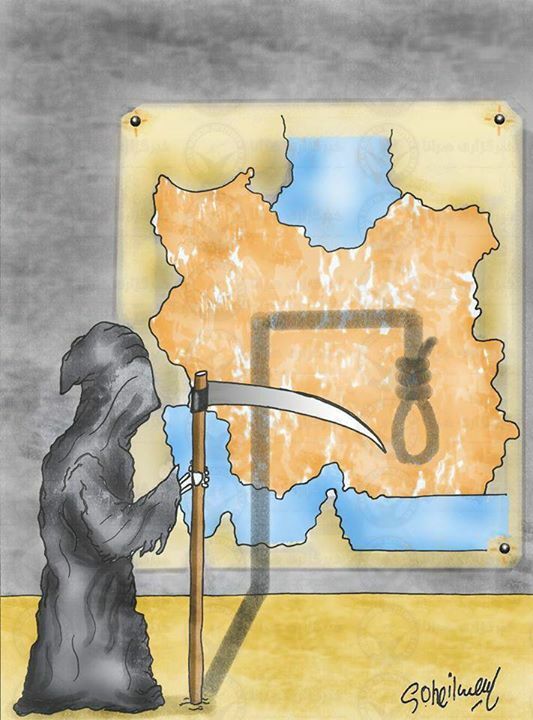 According to the Latest report by Dr. Ahmed Shaheed, the UN human rights rapporteur, ever since Rouhani became the president of Iran, a surge in executions has given Iran the world’s highest death penalty rate per capita. Dr. Shaheed reports that at least 852 individuals were executed in the period since June of last year, including eight juveniles. The surge in executions shows that Rouhani has failed to deliver on his campaign promises to improve the human rights situation in his country, a year after taking office. Dr. Shaheed also states that Rouhani is unable to address the issues, unable to arrest this trend, and to convert his promises which spoke to arresting this trend into action. While the international community is focusing on getting nuclear deals with Iran, it is easy to ignore that Iran is also one of the world’s worst human rights violators. When the constitution of a country and the law of the land are based on Sharia and Islamic law, inequality between men and women, Retribution Law, Execution for being enemy with God (Mohareb), death by hanging(1), there is no hope for condemnation for such actions. K.Taheri: Many human rights activists believe that the West is using “human rights” as a tool in Iran for political and diplomatic concessions. In what ways do you feel that the international community and the West could facilitate improvement of the human rights situation in Iran? Sh. Assadollahi: After Rouhani became President, the U.S administrations of President Obama, and the EU, under the pretext of diplomacy, have taken advantage of conditions bring economic advantages for all three parties. India and China Ignore US Sanctions Against Iran Iran; USA Secret Talks Nuclear Deal Talks ; Iranian Nuke Deal an Islamist Victory Iran’s State Media Agency, Press TV Reports that France BNP Paribas accused by US of ignoring Iran Aanctions But when the Iranian regime’s killing machine increased into accelerating its nuclear program, people went the usual route, from being concerned to being indifferent to being complicit. The West probably assumed that Iran would doubtless demand that any cooperation in with the West in human rights be compensated for by “concessions” permitting its nuclear weapons program. The West seems desperately eager to give Iran nuclear capability — perhaps from the pressure of business lobbies and perhaps out of America’s panic-stricken need for a “legacy.” What Obama does not realize is that if he does let Iran acquire nuclear capability, his “legacy” will be just like that of Britain’s Neville Chamberlain — a historical laughing-stock — who held up a piece of paper he foolishly thought assured peace with Hitler. Anyway, therefore the U.S. did not being up the issue of human rights at all — — even Iranian assurances to release innocent political, religious and ethnic minority prisoners — in order not to disrupt any attempts to let Iran go nuclear. Horrible. The U.S. and West should not accept any compromise on shutting down Iran’s nuclear-weapons program. It should not allow Iran any opportunity to blackmail the West into a compromise on it on the pretext of its “helping” to fight the Islamic State [IS]. United States Secretary of State, John Kerry on September 20, 2014 cordially invited Iran to play a role in arresting the momentum of IS in Iraq and Syria: “There is a role for nearly every country in the world in turning back the militants and debunking their ideology, including Iran,” he said. Iran’s regime, Shiite, would be happy fight ISIS, Sunni, anyway. Or better let the West fight ISIS for them. If Iran’s regime, with its open track record of duplicity, continues to be appeased by the Obama Administration and the P5 + 1, any “deal” will only destabilize the Middle East — and the West. If Iran is able to have nuclear-tipped missile pointing at Berlin, Paris and London, it will not even have to use them. The temptation for political blackmail would be in solidly in place. Nuclear weapons would also strengthen the very terrorist jihadist groups — the ones Iran has been funding all along — that the West claims it is trying to counter. The responsibility for disastrous results from any negotiations will lie at the feet of the G5 + 1 in general, and President Barack Obama in particular. Another nail in the coffin of his totally failed foreign-policy legacy, starting with his laughable “reset” button with the KGB’s [Soviet Union’s secret police] Vladimir Putin and his promise of “more flexibility” with Medvedev. As Garry Kasparv said the other day, the problem is, Obama IS flexible! K.Taheri: Many Iranian’s believe that the impact of sanctions is not on the government and is only affecting the lives of citizens and sanctions make life more difficult for them. Do you think that the sanctions are effective against the Iranian regime and will they help to improve the human rights situation in Iran? Sh.Assadollahi: The Iranian regime together with its lobbyists and apologists, such as the National Iranian American Council [NIAC] in the U.S., continue their attempts to influence the Obama Administration to relieve sanctions and permit concessions to allow Iran to acquire its nuclear capability. Negotiations keep being delayed, foiled and extended by Iran. Concessions –including billions of dollars in sanctions relief — keep being given by the P5 + 1. For what? To Iran’s supreme leader Seyed Ali Khamenei, this burlesque just makes Obama and his administration look weaker and weaker. Each concession only reinforces that perception. Even more disturbing is that many people inside Iran have alerted the U.S. Administration for more than two years about more — other — industrial facilities secretly being built in Iran; these have not been declared to the International Atomic Energy Agency [IAEA]. So far, all the intelligence provided from within Iran has been willfully ignored by the Obama Administration. At this point, it is not possible to believe that this information is being ignored out of ignorance. That leaves, as other possibilities, either the successful influence of Iran’s lobbyists and perhaps also commercial interests exerted by individuals or companies already counting the millions they will get from doing business with Iran. Iran’s human rights atrocities are also studiously ignored by the Obama administration, in favor of sitting down at the negotiating table with those who cause them, not realizing, as the former Soviet dissident, Natan Sharansky explains [FN: The Case for Democracy by Natan Sharansky] : a country that does not treat its own citizens well, will probably not treat is neighbors any better. The regime of Iran needs to know that the international community is serious and Iran’s Human rights abuses will not go unnoticed, but clearly the P5+1 are not serious. Sanctions have played the most effective role for the Iranian regime to act on its international obligations, and they have been lifted. K.Taheri: What is your perspective on future U.S. negotiations with Iran, as a result of the recent election victory by the Republican’s, who now hold the majority of seats in both the Houses and Senate, and will it have any effect on the situation of human rights in Iran? Sh.Assadollahi: I am a Canadian citizen and live in Canada, but I closely follow the US policy in Iran and the Middle East. As you may have seen, the Islamic Republic of Iran’s horrific human rights record has been brought to the forefront by the Iranian-American community. The Republicans have been extremely helpful in bringing attention to this matter. Senator Mark Kirk & Marco Rubio introduced Iran Human Rights Accountability Act of 2014, not only to crack down on Iranian human rights abusers, including Khamenei and President Rouhani, but also to support the Iranian people’s hopes one day to have a democracy. What does our desperation to get a nuclear deal “at all costs” say to the modern-day Iranians rotting in Evin prison? Or to the young social-media savvy generation who took to the streets in 2009 after Mahmoud Ahmadinejad’s fraudulent re-election? The West, unfortunately, does not seem to give a flying celo-kebab about that. In 2009, President Obama left these Iranians questioning The United States of America’s commitment to their cause– apparently correctly. K.Taheri: Finally, as a human rights activist, how do you foresee the future prognosis for improved human rights in Iran? The permanent and peaceful solution to this crisis is something that only Iran’s democrats being silently murdered in the Iran’s prison cells, along with the help of the free word and the new people elected by the good people of America. We just saw how tired they are of being lied to by government operatives calling them “stupid.” Together, they can and will bring human rights back as a crucial value: when it is denied in one place, it can soon be denied every place. Qanon-e Qisas (Retribution Law) This law codified other aspects of the sharia. It subdivided crimes into hadd – those against God – and those against fellow beings, especially other families. Some punishments are mandatory; others, discretionary. “Based on the notion of lex talionis, the Qisas Law calls for ‘an eye for an eye, a tooth for a tooth, a life for a life’, unless the victim or his/her family forgive the perpetrator, and/or accept compensation for the death/injury (blood money). In 1991-1994, Iran combined all of these laws into the unified “Islamic Penal Code”.